< World Famous Mambo z Pohranicni Straze ! Diamond K9 is owned by kennel partners Lisa Hendrickson of Saint Ignatius, Montana and Vicki Kellum of Aubrey, Texas. Our world class working german shepherd breeding program consists of internationally titled imported males and females as well as top quality USA born breeding stock. The Diamond K9 breeding program is committed to raising healthy, balanced german shepherds with solid character and strong nerve. Our dogs and their resulting puppies boast excellent structure, strength of bone, and dark pigment. 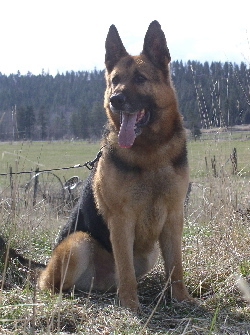 Diamond K9 strives to raise and promote top quality german shepherds. Our stud dogs are recognized as world famous working dogs. These dogs boast excellent Czech Border Patrol and East German (DDR) bloodlines. Our pups are well suited for work in Law Enforcement, Search and Rescue, Detection, Top Competition Sport, and Personal or Property Protection. Two US locations, in Montana and Texas, where our dogs live non-kennel lifestyles on livestock ranches. Diamond K9 dogs are well socialized and normally travel in vehicles daily. They are accustomed and conditioned to many other animals on the ranch; including horses, cattle, dogs, cats, and even buffalo! We invite you to contact us today about purchasing your next german shepherd from Diamond K9! < World Famous Balli Panta-Rei !